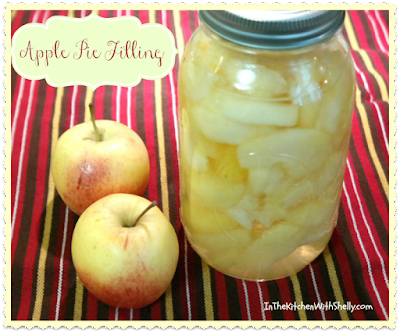 I love to make and can my own apple pie filling. The fruit filling can be used all kinds of different ways. I've used it to make apple pies, crisps, cobblers, turnovers, cakes, breads, etc. Seriously, this apple pie filling recipe is very versatile and it's a staple in my pantry. Every year I make and can at least 2 dozen jars of homemade apple pie filling! The recipe that I like to use is from the Ball Blue Book - Guide to Preserving. This recipe will yield 6 to 7 pint jars. Wash, peel, core and slice apples. Some people slice them into rings but I like to peel, core and cut into thin wedges. Treat with Fruit-Fresh to prevent apples from darkening. Combine granulated sugar and water in a large stock pot or saucepan. Bring mixture to a full boil, stirring until the sugar dissolves. Boil for 5 minutes. Remove pan from heat. Drain apples from water and then place them into the hot syrup and let stand for 10 minutes. Bring apples and syrup to a full boil over medium to high heat. Reduce heat to a simmer and simmer for 30 minutes. Remove apples from syrup, keep hot. Return syrup to a boil. Layer hot apples loosely into a hot canning jar. Ladle hot syrup into the jar leaving a 1/2" headspace. Wipe rim, add seal and add the band until it's fingertip tight. Place jar on the rack elevated over simmering water of the canner. Repeat until all jars are filled. Lower the rack into the simmering water. The water needs to cover the top of the jars by at least 1" in depth. Adjust heat to medium-high and bring the water to a boil. Process the jars for 20 minutes. Turn off the heat and remove cover. Let jars sit in the hot water for an additional 5 minutes. Remove jars from the caner and place them on top of a towel on your counter to cool. After 12 hours, check to make sure all jars sealed properly. I never realized that canning could also be used to make and preserve pie fillings . This is great when you cannot obtain the fresh fruit and want to make a pie, cobble,etc. - since the supermarket canned fillings are always too gloppy for me.